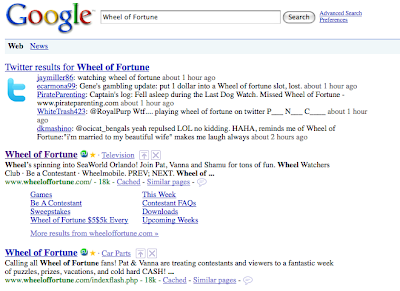 A lot of people think that real time search is the "next big thing" in Internet search results. When you search for something on Google now, you simply get results of websites that mention your search term. But for some searches, especially those related to current events, it would be nice to see not only websites, but what people are saying about what you searched for right now. If you use Firefox, there's a great Greasemonkey script that enables real time search results very nicely. Whenever you search Google, this script adds a small section of Twitter search results right at the top which are pulled in real time, meaning you get to see what people are saying about your search live. It's actually really slick and doesn't clutter up the Google page at all. I highly recommend it. Download the script here. Enjoy!